Android Phones vs iPhones (iOS) - Which is the Best ? Which Should You buy ? From Forums to Blogs, Social networks to Tech Communities and even Online to offline, there are always debates and rivalries about so many Tech-related issues. The debate on Smartphones and Mobile Tech too is not left out. Every committed owner of an iPhone thinks their iOS Smartphone is the best, a die-hard Android user also thinks his Android Phone is better than the best iPhone while most Blackberry users also think they've got the best personal assistant which will help their business grow. To say the fact, we all know that Android and iOS are the best mobile OS and the most discussed everywhere in the world but is it really possible to have 2 best mobile Operating System ? Probably No, because one will always be better than the other even if it's just with few points. So, when it comes to buying a Smartphone, which one should you buy ? 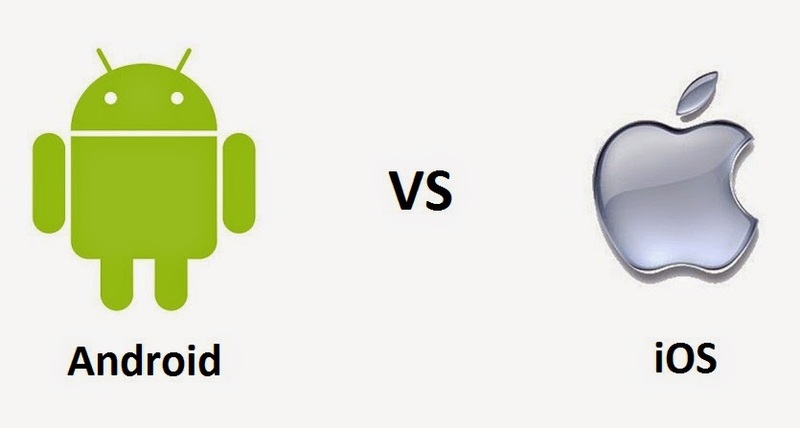 Android or iOS ? Honestly, the choice is yours and you'll be the one to decide for yourself (because Android and iOS are very close when it comes to judging them with their Pros and cons, an advantage of iOS over Android usually turn out to be its disadvantage under Android) but these are the things you must know and consider before buying any. The saying - 'You cannot have your cake and eat it' is very true as far as Smartphones are concerned. If we are to have our cake and eat it, then many of us will surely want a Smartphone that is open source, giving us the ability to tweak and twerk to our own taste and at the same time, secure and free from Malware attacks, also offering amazing features with a big & better battery life yet all these cannot be present on a single device, that's why we have to either have our cake OR eat it. So, do you want to have your cake OR eat it ? Please read through the unbiased points below before you decide. Android - Better Design, Different Varieties => Android phones have better designs, don't get me wrong on this, they don't have the best designs but they have better ones in the sense that, there are so many Android phones to choose from and their designs varies from one to the other unlike iOS, iOS is only available on one phone - which is the iPhone. Some may find the iPhone design awkward and at the same time love iOS, ooh if you are one of them you just have to deal with it. On the other side, if you like Android you have the chance to choose from any design you like ranging from Samsung (maybe the Galaxy Alpha), HTC (HTC One M8), Sony (probably the Xperia Z3), ASUS (Zenfone 6), LG (G3), Xiaomi, One Plus One to Huawei and so many others. iOS - Security and Privacy => Is there anyone who knows a lot about Smartphones and still don't know that the iOS is the most secured, protected and a malware-free mobile operating system ? Ooh, please wake him/her up. Well, maybe it's duly because of the measures Apple's been taking on their iPhones and every other iOS devices generally, they don't allow you to connect to other phones through Bluetooth (with the exception of the newly-released iPhone 6 and iPhone 6 Plus), you don't even have a memory slot not to talk of inserting a memory card on your iPhone, you can't install 3rd party Apps except from the App Store. All these have made and still making iPhones the safest and more secure phones though this doesn't mean Droids are unsafe. Android - Open Source Operating System => Yes, another Pro of Android is being open source. What does open source means ? It means it is open, open for everyone thus allowing its users to twist and roll the OS to their own very taste, they can even install and run Apps directly from other sources without compulsorily downloading from the PlayStore. Furthermore, Manufacturers, Developers and even Savvy users have more-than-enough permission and ability to modify the OS, no wonder Android powered projects like Cyanogenmod and MIUI are very successful and turning to one of the next big things. iOS - Consistent Interface => Even though there are pros in having an open-source OS on a phone yet there are still cons of it. Now, the saying comes to my mind - 'A man's food is another man's poison', the advantage of Android being open-sourced is now a disadvantage on iOS' part because it doesn't allow consistency. This is what I mean, the process of enabling and disabling WiFi on any iOS device is the same while it is not the same on Android: the procedure to on WiFi on a Samsung Galaxy S5 for example (which uses the Touchwiz UI) is different from HTC One (which uses HTC Sense UI). So, homogeneity is another pro in iOS because with your iPassword, you can sync your docs, photos etc across iOS devices using iCloud. [You can read about the latest security breach on iCloud here --> Apple iCloud hacker releases more n*de pictures of celebrities <--]. Android - More Features => The high-end Android Phones not only have more features than the iPhones but they also get those new features quickly. There are so many new and amazing features on some 2014 Android flagships which is no where to be found on the recently released iPhone 6 and its bigger bro, iPhone 6 Plus. Apart from the fingerprint scanner which came out on the iPhone 5S before it arrived on any Android Phone, many other features get to Android first before getting to iPhone, with some years interval at times. Near Field Communication (NFC) has been around on Android since 2012 or so while it is just getting on the iPhone this year, the first and last waterproof Phones (up to this moment) are Android phones. Samsung Galaxy S5, Samsung Galaxy Note 4, Samsung Galaxy Edge and Galaxy Alpha all boast of a Heart rate sensor which is not yet on iPhones. iOS - Speed and Portability => As far as speed is concerned, the iPhone deserves kudos because it is very fast and it responds to every user interaction almost immediately, although so many Android phones are as fast as iPhones but the low-end Android Phones cannot just keep up with the pace. Portability is another reason why you might prefer the iPhones over Droids, before breaking the rule this year, all iPhones usually come in a small portable size but with the iPhone 6 Plus, Apple iPhones are now getting bigger. Android - Low-end, High-end, Affordable prices => Maybe this is the main reason why there are so many Android users more than iOS users, Android Phones are in wide and different varieties. We have the High-end Android Phones which are not too expensive and still delivers almost everything, in fact everything the iPhone 6 will deliver, under this category, includes Smartphones like Samsung Galaxy S5, HTC One (M8), Samsung Galaxy Note 4, LG G3, Sony Xperia Z3 etc. Also, the low-end Phones which are very affordable and still delivers great Android experience, under this category, there are phones like Infinix Zero X506, Tecno Phantom A3 and so many others. In between the High-end and Low-end phones, there are still so many mid-range phones to choose from, but on the other side of the wall, there is nothing like low-end or mid-range, everything is just high. iPhones are always expensive even more than the high-end Androids, you can compare the iPhone 6 price to that of Samsung Alpha to see how true this is. iOS - Get Apps First => With all the findings and researches I've done personally, I notice that iOS seems to get Apps faster than Androids. When a new App is about to be released, iOS users always get and enjoy the App first before Android users get them later. When the Fiverr App was released, the iOS version came out earlier than the Android version, we had to wait for couple of weeks (or even months) before it was rolled out to Android, same thing happened with Instagram and Vine. They say - "The patient Dog eat the fattest bone", android users also benefit from their extra time of waiting because of the flexibility they enjoy with their Apps though. Android - Wide sharing ability => This awesome feature is not often mentioned by Smartphone users maybe it's simply because they don't notice it or they just choose to neglect its usefulness. With the wide sharing ability on Android, you can transfer images, text, links and other forms of data from one App to another. To use this feature, tap the share button on any supported App then a list of all other Apps which allows sharing of the data between themselves will come up, just click on the one you want to share to and voila !!! To someone who is impartial about Android and iOS, I know it will be a very difficult decision to draw conclusion and decide which of these OS to stick with. With the few points analyzed above, which one will you go for and why ? But for many of us who already made this decision, why did you choose the Phone you are using presently ? Please ensure you drop a comment on this post using the comment box and kindly share this interesting post with others. The share buttons below will help you do that. Peace !! !